The Nazi party was the &quot;National Socialist German Workers' Party&quot; or NSDAP, a center-left socialist party who silenced their political opponents through violence and intimidation. The fact that the modern left justifies silencing their political opponents through violence and... - Amirite? - Post your opinion and see who agrees. So not true. Hitler outlawed the SPD (Social Democratic Party of Germany), the KDP (Communist Party of Germany), and other labor unions in 1933. Their ranks were decimated and their members forced into the first concentration camps. While the Nazis had "Socialist" in their name, they were not socialists. You seem to assume that leftist groups get along, history has shown that is not the case. As a current example, the Canadian provinces of BC and Alberta both elected NDP governments. So anyway, these two NDP governments should work together perfectly, right? I mean, they're the same party after all. Well as it turns out, the Alberta NDP want this particular pipeline to go through to the coast, and it was a done deal, but at the time the deal was signed, the Liberal party was running BC. When the NDP got into power in BC, they decided that the pipeline was too risky, (despite the fact that there had been an extensive environmental review process and it was just twinning an existing pipeline) so they bent the rules to shut it down. In response, the Alberta NDP banned imports of BC wine. So now the two provinces are basically in a trade war. And so it is with the left, their nature makes it easy for them to fall into conflict, even if the other side is the exact same political party. People who don't know history are doomed to repeat it. 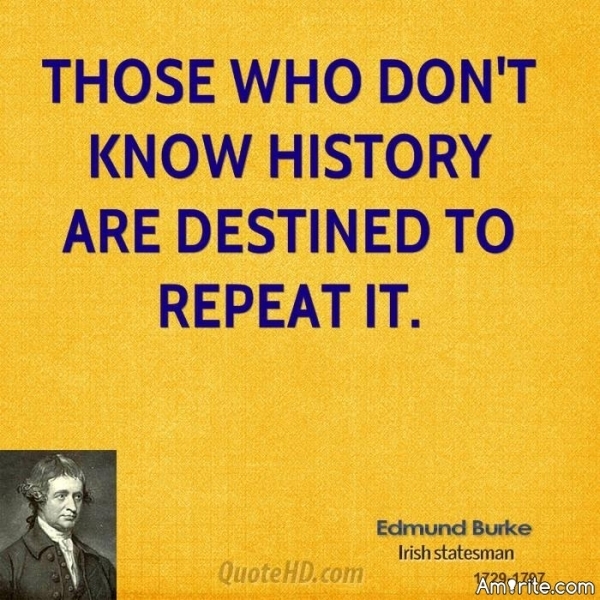 People who do know history are doomed to watch helplessly while everybody else repeats it. Words don't mean anything. They are only codes for unspoken hatred. For instance, even the people who invented fascism could not agree on what it meant. Once I was chatting with a young man and he suddenly blurted "You're a libertarian!" I had never heard the word before so I asked him what it meant. He could not explain, but whatever it meant, by god I was one!